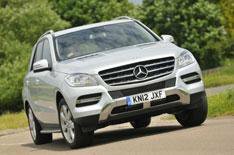 2012 Mercedes ML250 Bluetec review | What Car? The new Mercedes ML has cleaner styling than ever, and this all-new entry level 250 CDI model is the cleanest in the range's history. Mercedes quotes average economy of 44.8mpg, and emissions of 165g/km putting the ML 250 Bluetec in road tax band G.
What's the 2012 Mercedes ML250 Bluetec like to drive? The new, small turbodiesel engine is beautifully mated to the seven-speed automatic gearbox. Unless you've got your foot planted flat on the floor, you won't hear much diesel rattle in the cabin because the 'box is configured to change into as high a gear as possible, keeping the engine revs low. Drive the new Mercedes ML through town, over speed bumps, or down a bumpy country road, and you'll notice the comfortable, absorbent ride. Saloon and estate drivers will find the body roll in corners takes a bit of getting used to, but it's fairly well suppressed for this size and type of car. What's the 2012 Mercedes ML250 Bluetec like inside? There's more than a hint of E-Class to the new 2012 ML, particularly in the cabin. Anyone familiar with the E-Class will recognise the view from behind the steering wheel. This is most definitely a luxury car that is also an SUV, rather than vice-versa. The dashboard and centre console work remarkably well everything is within easy reach, and it takes just a matter of seconds to adjust the seat and steering wheel to get a comfortable driving position. Visibility is pretty good, except to the rear, where the big pillars and high lip of the glass mean that you're glad of parking sensors, even if you're used to manoeuvring a big car. Possibly the smallest visible change over previous Mercedes cars is the downsizing and relocation of the wiper/indicator stalk, which used to be a hugely oversized affair. There's a competitive amount of headroom and legroom in the rear seats SUVs often offer slightly less than you'd expect from the exterior dimensions and the loadspace is large and easy to lift luggage into. If you've got concerns about getting around in the winter snow, need to pull a trailer, or simply relish the extra visibility and feeling of safety offered by a raised driving position, then there's much to recommend the Mercedes ML. Certainly, anyone looking to literally 'move up' from a Mercedes saloon won't be disappointed. The best news is that anyone moving to the brand will be similarly impressed. Those after the latter should consider a four-wheel-drive estate (unfortunately Mercedes doesn't sell its 4Matic E-Class in the UK), but everyone else should get in the queue for an ML test drive.